Chandeliers, quite literally, light up your life. Yes, we can hear that duh, obviously! that’s running through your mind. But bear with us for a moment! The impact lighting, or more specifically: light, has on your psyche has been scientifically proven time and time again. A well-lit room does just as much to lift your spirits, to foster relaxation, to help concentration, or to boost energy, as satisfying hobbies, trusted friends, and good food does. What studies of all kind fail to recognize, however, is the effect aesthetically pleasing light fixtures have. And more, how easily a room can be transformed by the addition of just the right kind of luminaires. Chandeliers in particular have this transformative power. Depending on your choice of style, a chandelier can add gravitas, luxury, elegance, flair, geometry, retro style, homeliness or comfort to any room. To help you navigate the many different styles and shapes of chandeliers available, we’ve collected the most common (and beautiful) varieties for you. Strictly speaking, you can differentiate between two types of chandeliers: the traditional, and the tiered chandelier. The traditional chandelier has its lights arranged on one level. This type can be characterised by ornate details, scrolling, and filigree, and can come in any style. 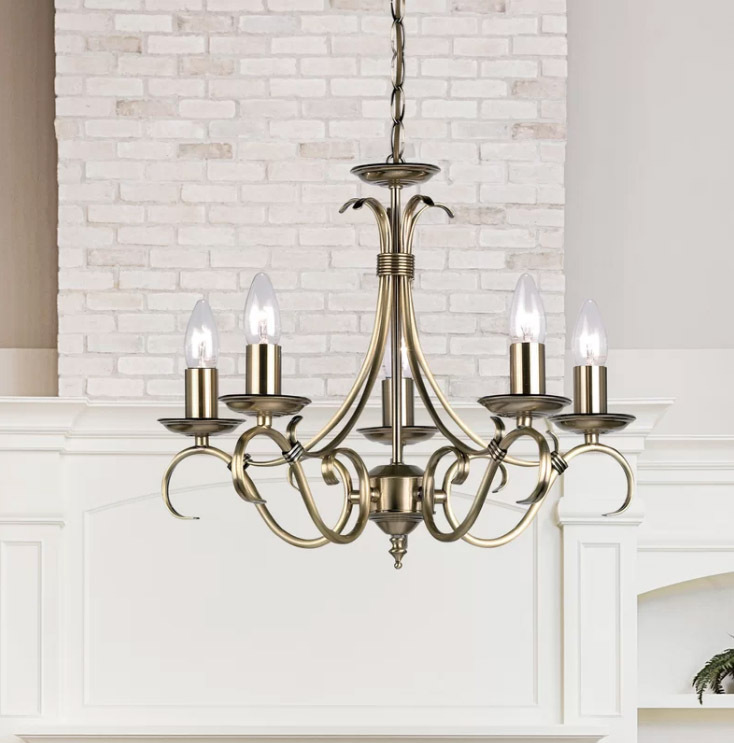 Since, as the name suggests, it is the more conventional option, the traditional chandelier will fit in nearly every room, regardless of size or design. Its most restrained forms add understated elegance, its more elaborate forms quiet luxury. In contrast to the traditional type, the tiered chandelier has its lights arranged on multiple levels. The most basic type boasts two levels, but there are no limits upwards. As long as the room is high enough, there’s nothing stopping you from going all out when it comes to numbers of tiers. Again, this type of chandelier can come in any style, though due to its inherent grandeur, the more multi-layered versions tend to increase in elegance proportionally to the number of tiers. Tiered chandeliers add elegance and luxury to the room, providing a visual focal point that is hard to recreate in any other manner. The crystal chandelier is most likely the style that instantly comes to mind when you hear the word “chandelier”. 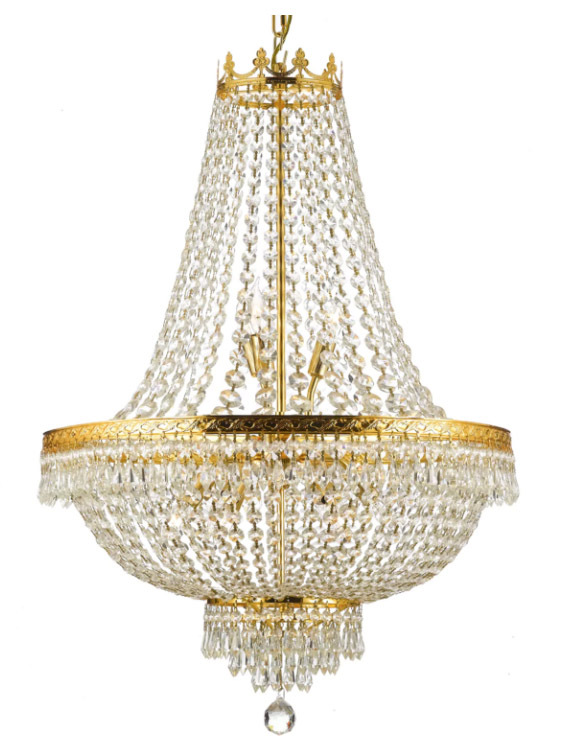 In general, this style describes chandeliers whose lights and/or tiers are surrounded by or attached to rock or glass crystals. The crystals by themselves add a certain glamour to the lighting fixture, however their main purpose is to break the emitted light, creating beautiful rainbow-coloured reflections in the process. Due to their elegance, crystal chandeliers are better suited to luxurious rooms, adding drama and richness to any formal setting. They work beautifully as statement pieces in your foyer, add beauty to your dining room, or speak of luxury in your living- or bedroom. Due to their ornate style, even the smallest crystal chandeliers draw the eye and work best in rooms befitting their chic. However, done right, a crystal chandelier can be beautifully used to juxtapose classic elegance and casual understatement in your home. The terms shaded and glass chandelier can, in most cases, be used interchangeably. Glass chandeliers are, as you might guess, the style of chandelier that comes with glass shades around the individual light bulbs. Shaded chandeliers typically see those glass covers coloured or smoked, however there are some variants that use cloth or other sheer material for their shades (these, obviously do not qualify as the glass style). The beauty of glass/shaded chandeliers is their incredible variety. 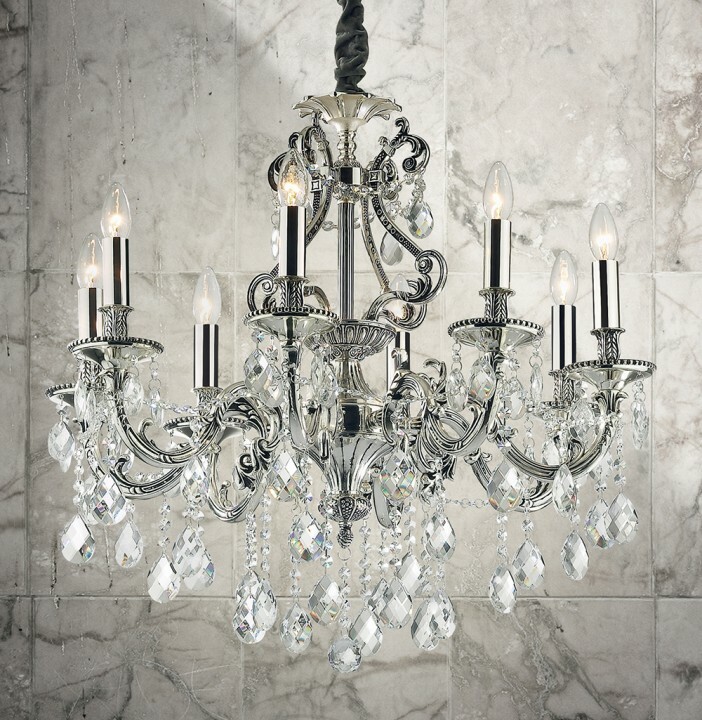 This style of chandelier comes in many variants, from rustic to incredibly ornate crystal, and thus fits any room. Another added bonus is that you can easily make the shaded style seem as if it was built with your specific room in mind by choosing a glass coloured matching your sofa, wall colour, curtains, etc. True glass chandeliers with clear covers usually fit best in airy rooms or places you require good, bright lighting (such as a study or an open-plan kitchen slash dining area). With shaded chandeliers, on the other hand, you can effectively create a more discreet lighting effect that promotes coziness or romance (like you would want to have around your sofa or in the bedroom). The candle style can mean either of two variants: a chandelier with lights that look like candles, or a chandelier using actual candles for lights. The more common of the two is, obviously, the one pictured above: the one with lights styled like candles. 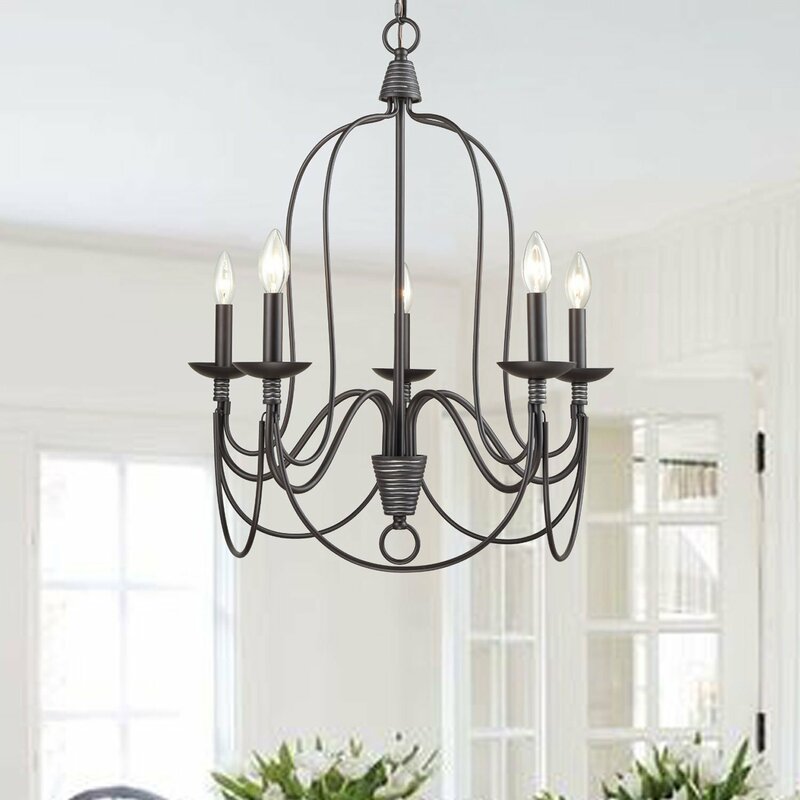 Typically for this kind of chandelier you will want to pick light bulbs that mimic the shape of candle flames, thus increasing the illusion even further. The second variant, however, has grown more and more popular these past years. 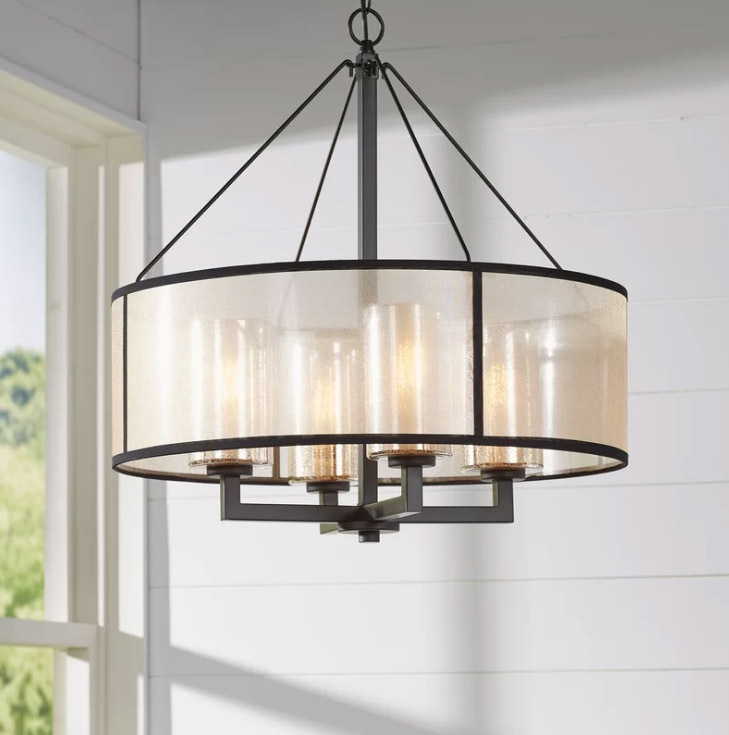 While it is rather unusual to encounter this type of lighting in an indoor setting, there has been a resurgence for true candle chandeliers in semi-outdoor places like conservatories or roofed terraces, where softly flickering candlelight greatly enhances the atmosphere. Generally speaking, candle chandeliers are fairly formal, and oftentimes come as a hybrid with the crystal chandelier, evoking the splendour of the time when flickering candle candelabras lit up opulent ballrooms. There are, however, also more restrained styles, like the one above, that add a certain rustic charm to the room with their understated, clear form. 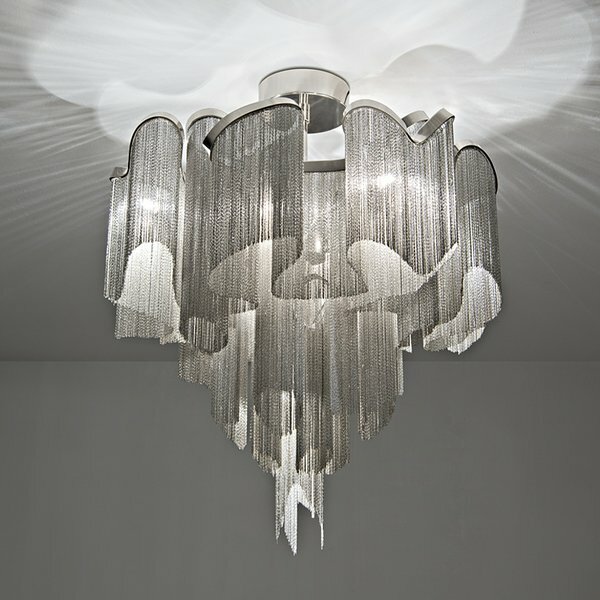 The drum chandelier is a simple, elegant style that typically has a series of light surrounded by a drum-shaped shade. Typically, the shade is made of crisp, light fabric that creates a beautifully soft light. The fixture itself oftentimes is made up of clean chrome, nickle, or silver, thus creating an understated look of elegance that fit nearly every room. The drum chandelier is perfect to give focus to a specific area of a room and is therefore also perfectly suited mounted in your office space or over a table. With their soft lighting, drum chandeliers are also particularly well-suited for bathrooms and bedrooms. 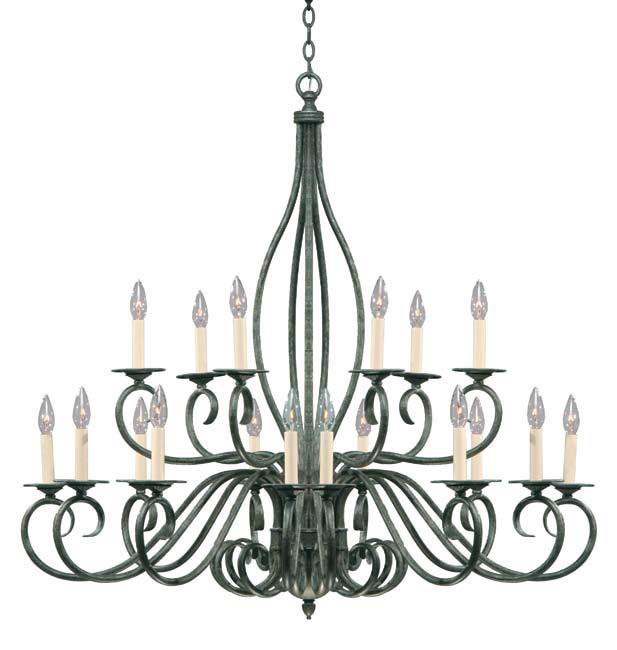 The empire chandelier is a very classic and formal style that grants elegance and tradition to the room. An empire style lamp is defined by its shape. The chandelier is made of two parts – the upper part is cone-shaped, while the lower is formed like a bowl or an inverted bell. Typically, the empire is a sub-form of the crystal chandelier, in which the crystals themselves make up the distinctive shape. This type of chandelier fits best in a grand, upscale setting, preferably in older buildings with high, ornamented ceilings. As the name suggests, the waterfall style chandelier evokes memories of water droplets cascading down the fixture. In general, the waterfall chandelier is a variant of the crystal style, whereby the crystals themselves oftentimes are shaped like drops or appear in the form of glass “strings” to simulate rivulets of water. In terms of form, the waterfall chandelier can come in a variety of bases – round, square, geometric, ornate,… . This style, therefore, lends itself to a wide range of room designs, ranging from the elaborately formal to the stylish geometric. The sputnik design is a staple of the art-deco era. This chandelier style derives its name from the (Russian) astronomical term for satellite, and echos this association in its style. A number of arms branch off from a central point, sometimes in a regular fashion forming a circle, sometimes in more random patterns that evoke associations to a star pattern. 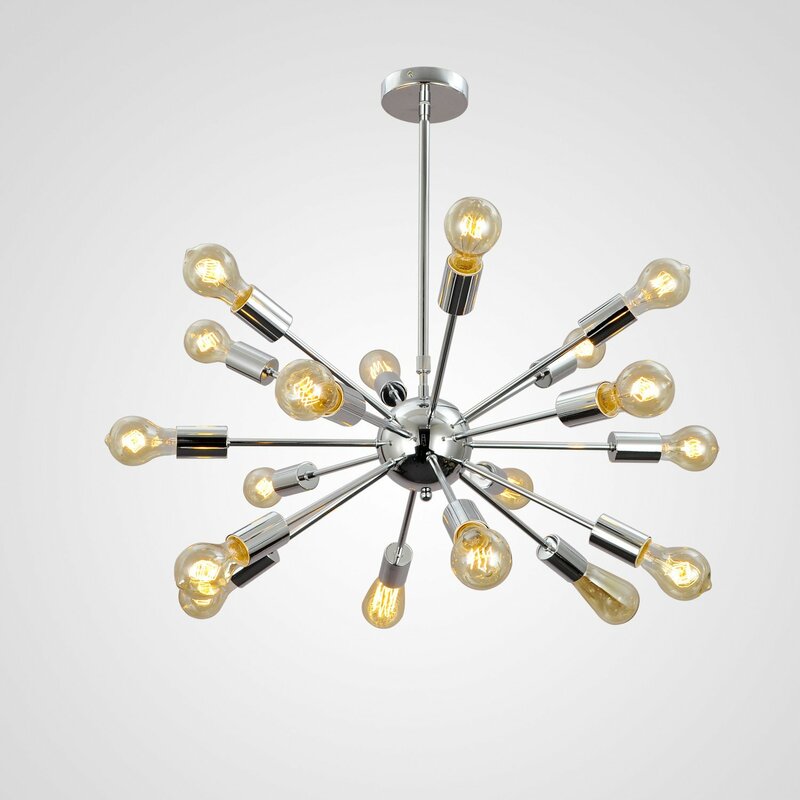 The sputnik chandelier is a very fashionable light fixture that fits wonderfully into stylish living- and bedrooms. And if you feel adventurous, the sputnik style can be used to creatively break up a more classic setting, for example a formal dining room that would usually see the use of a crystal chandelier. 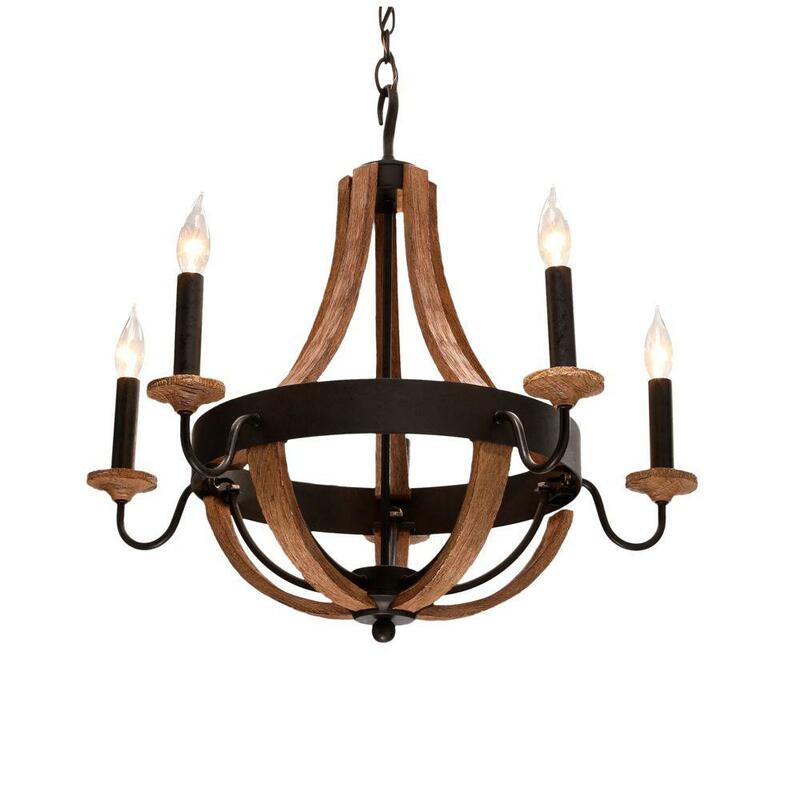 Rustic chandeliers tend to feature clean, modern lines that mimic the drama of their classic glass-and-crystal ancestors. This candelabra style oftentimes blends wood with brushed iron, giving it a rustic, country-home feeling that adds warmth to any room. If you like the shape of more traditional grand chandeliers, but don’t have the rooms to fit those epic pieces, the rustic style might be a suitable choice for your home. 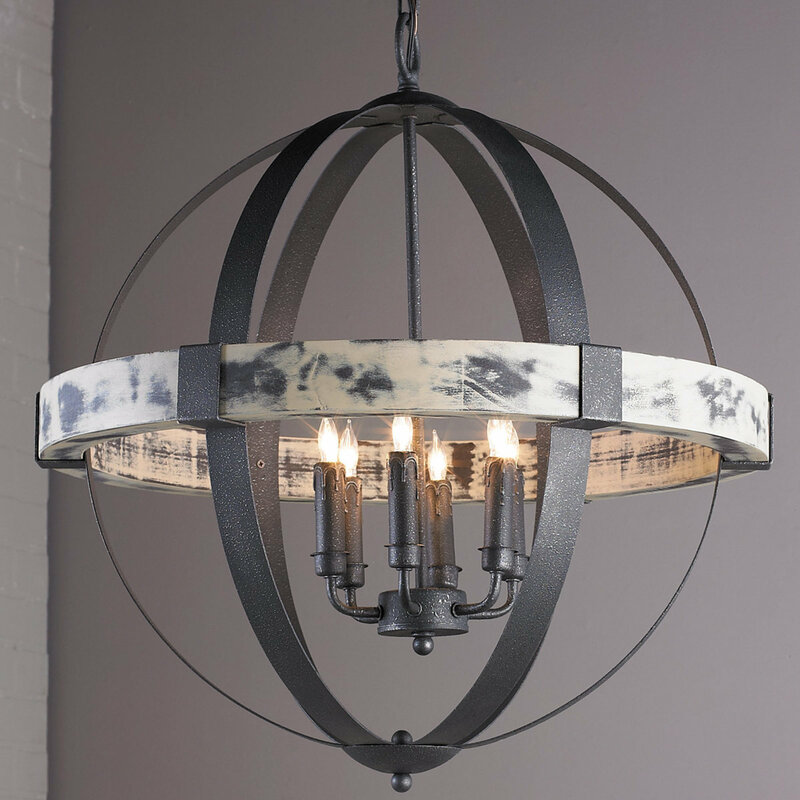 The name of this style says it all – this chandelier essentially is a series of lights surrounded by metal, wood, or other materials in a cage-like fashion to create a globe effect. 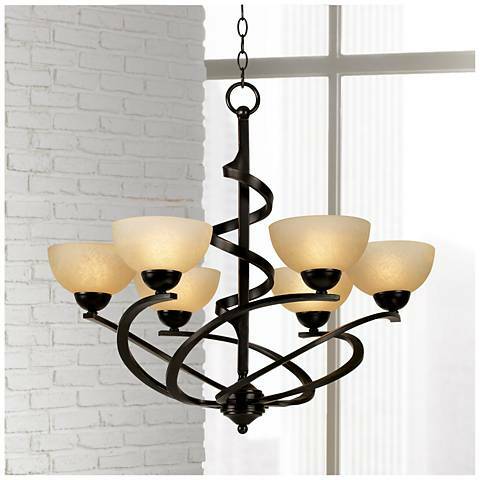 Since this chandelier comes in a variety of styles and materials, it can fit nearly every kind of room design. Try a reduced brushed iron globe to add a touch of softness to an otherwise geometrical modern living room, use a wood-heavy frame to add warmth and homeliness to your dining area, or chose a crystal-adorned variant to add glamour and elegance to your reception area. And finally, the contemporary style. Contemporary chandeliers come in a plethora of styles and designs, ranging from the bare minimalist to creatively futuristic. What this style does have in common, and how you are able to easily identify it, is an adherence to clean lines and a sleek design (even though the contemporary chandelier can have a bombastically elaborate overall-look). Oftentimes the contemporary style utilizes clear materials like stainless steel or glass, adding a touch of luxurious modernity to your home.